I first met Kim after my sister Amy told me that she wanted me to meet “someone that is very smart.” I thought, “Oh, yeah? Another one?” But, Kim was definitely different. 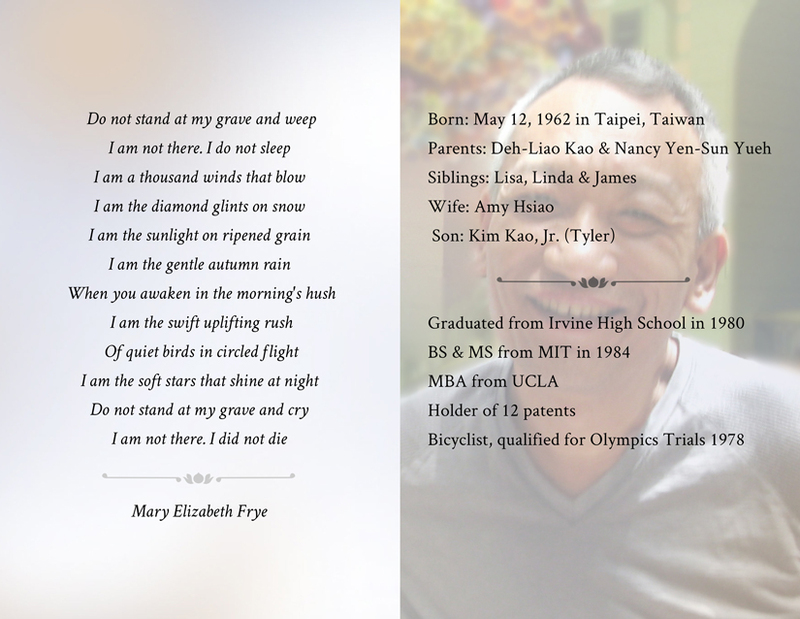 At that time Kim was getting an EMBA degree at UCLA, which is also where he met Amy. When I told him that I had degrees in electrical engineering and computer engineering, Kim said, “I have to show you this great thing that I am developing.” What he showed me were Laser Printer Labels that he was creating for Avery. That was about 30 years ago when the PC was becoming popular and people were using laser printers to print beautiful documents. Kim first showed me this sheet of blank labels, then launched a software application which had the exact layout of the labels on the screen. He joked, “Jimmy, I am sure you want some address labels,”and after he typed my address on one label, it populated throughout the sheet. Then, he printed out a full sheet of address labels from the laser printer. At that time, it seemed magical. But the magic was reality. It simply worked. When he got into the computer business with my sister Amy, he constantly came up with ideas for integrating simple hardware and software that led to mind-boggling products. That’s why Kim left Mattel in his early 30s, even though he was a rising star there. He had too much energy, passion, and intelligence to work for someone else. Kim has been more a brother-in-law to me. He was a business partner, mentor, and role model. Although his degree from MIT was in chemical engineering, his scope of knowledge was way beyond his field of study. Similarly, Kim’s innovation goes beyond technology. Recently I have been promoting the concept of “Lean Startup” at Logic. The basic idea of “Lean Startup” is to create a “Minimum Viable Product” through short and intensive cycles of “Build, Measure, and Learn,” so you don’t waste time developing things that people don’t want. Looking back, I realize that Kim was already preaching the same concept 20 years ago. Then we were working on the idea of an automated business center that we called Business Anywhere. The value proposition was to have business machines located in hotels so that the guests could use them 24 hours a day. This would replace the current costly process of having a computer rental company (such as Logiclink) deliver and pick up computers, printers, fax machines, and etc. as needed. The timing was perfect. I had just launched my own company, Logic Solutions, and I needed some projects to do. Kim asked me how much time I would need to create Business Anywhere. I said that it would probably take two months to complete. There were three major components, a hardware switching box to empower the chosen business machine, a software frontend for user interaction, and a way to accept credit card payments. The idea was innovative, but Kim wanted to have quick and simple solution to validate the market – quicker than two months. So, I used a mockup language called Director (that I learned on the fly) to write the software because it would be much faster than traditional methods. I had my friend Klaus Wolter design a switching box that would take the output of the parallel (printer) port to control the business machine. I wrote a modem-based credit card processing software to communicate with the credit card processor, which at the time was First Data. And although some hotels did have access to the Internet, Kim wanted to keep every thing at the minimum baseline: every computer had a printer port, every hotel had phone line, and the touch screen kiosk could be disguised inside a box. The first client or major installation was at the Los Angeles Hilton. Kim had the unit installed at a room in the lobby. Then he stayed there to court people to try it out. Once there were people in the room trying things out, he would run back to the minivan outside the hotel to watch the transactions go through modem line. He made sure that the user experience was so simple that even without a person inside to help, the payment system worked seamlessly through modem, and the machine was turned on for the user to use. Once it was proven that this was a product that people would use, Kim had his team make numerous iterations to perfect it. The basic hardware and software still work today. There are many interesting things that Kim’s team has done to make the product easy to use, easy to install, and easy to maintain. At its peak, there were thousands of hotels and cruise lines accessing these Automated Business Centers. No matter where these business centers are, they just simply worked. Not only Kim has been an inspiration to me, but an inspiration to many others. I sometimes would send my staff to California to work on projects and get inspired. As someone who loves the power of language, I will remember fondly Kim’s gift for verbal gymnastics. Even when I was completely intimidated by his brilliance, talking with Kim was a delight because it seemed that he was interested in almost everything. There were many times that I struggled to keep up with is mental agility, but the truly wonderful thing was that Kim wanted you to keep up, and encouraged you to keep up. He genuinely sought out your ideas and opinions, and was ready to be challenged on his. Kim always made you feel respected, even when he was a million miles ahead of you. Kim always told me that we need to be firm, but fair and kind to our employees. If it is something that he would not able to do himself, he would not ask it of other people. He once told a group of salespeople that they should be able to reach out to 100 new and old customers in a single day. When he sensed the hesitation, he dismissed the group and started calling a list of customers himself. By the end of the day, he renewed many contracts and talked to many clients about new ideas. He certainly went through more than one hundred hotels on the list in that one day. Kim was one of the smartest people that I’ve met; he was forward thinking with a can-do attitude. It is amazing that affection for Kim was so widespread. People who sold to him became his good friends, and his negotiation skills made the margin disappear. In fact, one of his hobbies was car shopping, and while doing so he would explain to the car salesman how the car was made, what the differentiation factors are, and how much fun it is to have such a car. He told the car salesman how to sell car to him. His knowledge of each car blew people away. At the end, he would often get a great deal and make a great friend. That was Kim. He was an innovator, mentor, leader, and great friend to many. He made things work, made people smile, and he was simply brilliant. I remember the first time I met Kim; I think it was 2010 or so, back when my office was behind the Trump building. I had just taken over the MGM Resorts International Hotel line of business for technology. I had heard many good things about the great work that Kim Kao was doing with mobile check-out. I had heard that Kim was super smart and that Kim was a creative thinker and great problem solver. I thought “I can’t wait to meet her” It’s not often that you hear that kind of praise for a woman in IT. Imagine my surprise when the six foot something tall Kim walked into my office with that big easy smile on his face, and stuck out his huge hand to greet me. I wonder what he thought of the look of confusion on my face, even though it was only there a second, you know he saw it. Kim and I went to work quickly and together cleared hurdles and roadblocks that were so easy to resolve, once you applied logic to them. Everything we did together from that moment forward was a success and Kim’s products were quickly rolled out to multiple MGM properties. Kim never one to rest quickly moved on to what’s next “Hotel Check-In, His enthusiasm for this project was matched only by his vision and tireless efforts. His excitement was contagious and his brand of thinking was transitive. Unfortunately he and I were not able to get this one over the goal line together as I moved onto other responsibilities. Kim was so happy for me to be recognized and put in a position that suited my abilities that he never expressed any concerns for his goals for completion of the project. It was not his way to detract from anyone’s desires to grow. For me it was bittersweet because as much as I loved working with Kim it allowed Kim and me to evolve our relationship from one of business into one of friendship. Our two families spent time together Amy and Tyler became more than just the names of Kim’s most loved individuals and became our friends. We had many stimulating and exciting conversations full of laughter and smiles. If you know Kim you know what I mean. I am so happy that I got to be friends with this great man, he touched my life and it will forever change the way I think and how I treat people. I feel honored to have known him. And it was interesting to see that his birthday was just two days before mine . It was wonderful to see how much he has accomplished during his time. And just like the poem at the end. Just enter a different time and place. But I know that he will always be close to his family . Well said. He is smart, funny and a great human being. We will miss him!!!!! Throughout the years ( since 2010 specifically ) Kim was that one contact I had, for any new technology ideas or implementations because everything was possible. It all began at the business center at MGM Grand, to rolling out his Ipads for express checkout at the lobby. I moved to other properties through the years and we always stayed in touch. Kim made projects seamless and was an expert in building rapport due to his genuine personality and integrity. He listened attentively, responded intelligently and carefully observed.. One thing he never failed to do during conversations was to show that big smile or share a laugh or two. We always met when he was in Las Vegas and it was always a pleasure. My husband and I hosted dinner one time at our humble home for Kim and Amy and it was true joy, they became our friends through the years. Kim and I were in contact a few weeks back after I left the MGM Resorts group. I had new initiatives for another venture at my new job so ofcourse I reached out to him, he said we’ll talk about it over ice cream. That was Aug.22. Kim was a great teacher as well because through his actions, I learned more about humility, percerverance and integrity. Thank you for the life lessons Kim, we will miss you. You and I crossed roads only in June 2016, sharing briefly but intensely from minute 1 since we met, our passions and curiosities towards life’s challenges, for people with their needs and their logics and sure enough, for cars (smiling!). I immediately recognized your discomfort, having lived it through other experiences and was quite amazed by your inner strength which was so much overcoming your physical condition. Chapeau! Not content enough, You challenged myself in my value propositions, looked into my statements and I replicated with all the enthusiasm I have which I bring in business and in life. I grabbed Your and all Your family smiles with my usual bright colors attitude and really, I was left with a fond and great memory in my heart which will remain with me for the rest of my days on this land of passage and beyond. Amy and Tyler completed the picture and we all looked like serene, like long time friends. What a wonderful emotion and on the first time I met You! These are the important moments in life if we are able to treasure them. It doesn’t matter how smart and successful we are if there is no soul behind the way we live. Kim, You weren’t just floating along the river; You have been teaching us all to use for good the gifts we are born with so we can build a nice boat to visit the river shores and picnic on them too, up and down, while our flesh ages itself according Mother Nature laws and the water passes under the many bridges. In fact we think life begins and ends in a River but true to life the River then becomes a Sea…. Kim, You have one splendid, glittering, smiling soul. Yes, You had a body which left us speechless and with a BIG gap to fill once You now appearently abandoned us alone here but Your soul IS and WILL be with all the people You love, respect and help and loved, respected and helped. Dear Kim, thank You for honoring us with Your ability of bringing out the best from us and all the ones fortunate enough to cross Your life path. We will honor You by living with the same love, happiness, care, will, commitment, passion. I will miss you my old friend. I want you to know that it was an honor to have been a close friend. We’ve known each other a very long time…..43 years to be precise. I will always cherish the memories of the times we spent together talking about various business topics. You always have and will continue to be in my thoughts and in my heart my friend…..
Kim is simply seems like Steve Jobs, he was very intelligent and way ahead of his time. most of the people were not even aware of how computers work and he was developing hardware and software which is now people are focusing to start. So many beautiful things have already been written in this blog about Kim’s life and his impact on others. Kim was many things to me: a person with a brilliant engaging mind who was at the same time so easy to talk with and so present and interested in listening to what others had to say. Generous. Innovative. Big-hearted. Kim inspired me in the early days of my career and it was such a privilege to know him and call him a friend, colleague and mentor. I remember his sense of humour and great big smile. Somehow I thought and hoped our paths would cross again in a way that would have allowed us to work together. There was something so dynamic and energizing about spending time with Kim. He remains in my thoughts and in my heart. I never met you Kim Kao. 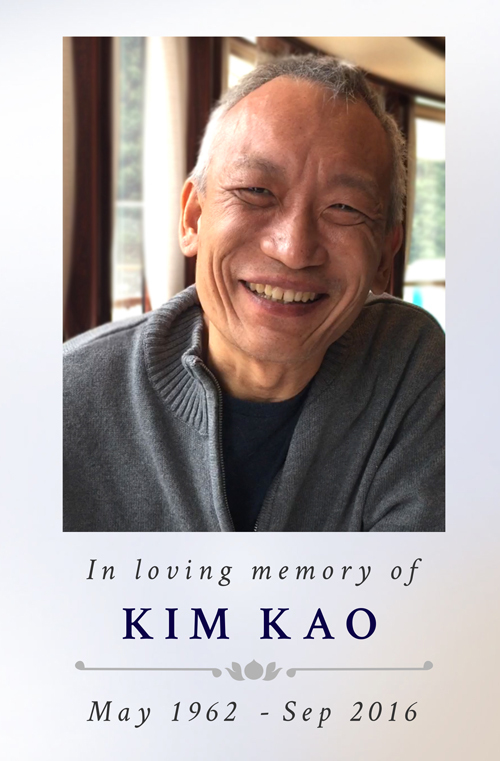 Unlike the others who have paid tribute to him on this site, I never met Kim Kao. Rather, I see his legacy; and that is a powerful image. I see his legacy in Las Vegas resorts, and in the professional hospitality people who’s lives he touched: both personally and in business. I see his legacy in the innovative solutions he conceived and delivered to improve the hospitality experience: solutions so many others had not envisioned. I see his legacy every time I meet someone who knew Kim and still remembers him with a warm heart. This rarely happens in Las Vegas: the land of continuous reinvention. But, most importantly, I see his legacy in his family. I’ve always believed that the true measure of a man is found in those he touched. No one could ask for a better family than Amy and Tyler. I never met you Kim Kao. But I know who you were, and I know your legacy. You can be proud. RIP my friend.